Whatever your holiday of choice is I hope you're festivities are off to a good start and that your 2013 is winding down nicely. So how'd you do this year? Did you kill it? Did you come close? You may remember the last couple of years I've done a “Last 100 Days of the Year Challenge”. I hit a rough patch these last few months of the year so I didn't fare as well as I would have liked. But even so I'm glad I took on the challenge because I came away with some valuable lessons, reminders and, of course, some “facepalm” moments. Here I want to share with you some of my biggest takeaways from this project. 1) Get to the root of the desired outcome when you select a goal/plan/challenge and come up with alternatives that may achieve the same feeling of accomplishment you are seeking. This year we didn't get as much snow as early as we did last year so I wasn't able to accomplish my #5, which was to ski 5 times by the end of the year. What I was really after was a way to get past my doubts and fears, and yes of course to get better at skiing, but my truest desire was to prove to myself I could do something that would push me outside my comfort zone. 2) Have your goals present at all times. For goodness' sake write you goals out and place them where you can see them everyday! No brainer, right?! Apparently , writing them in my notebook was not enough. There were many opportunities I could have done #4 (weekly date night) but I simply did not have “date night” on the brain! Seriously, how do you forget “date night”? 3) Thinking about it is NOT doing it. You will not get courage handed to you on a silver platter. So get over yourself and just do the work. Number 2 on my list was to “Blog more freely”. Meaning simply to write more, share more, open up more. Well, I didn't. I got as far as jotting down ideas, discussing them and or researching them. Yes time was tight, but it wasn't lack of time stopping me. It was plain ol' fear. Fear of looking or sounding stupid. So yes, I let imagined fear stop me. Lesson learned: playing it safe keeps things small, stale and boring. Note to self: stop playing small, get outside comfort zone and live a little...or a lot! 4) That thing that energizes you? Yeah, do that some more. One of my goals was to take a writing class. I did, I loved it and it went well. It wasn't easy since I'm quite intimidated by the blank page. But it was a great experience and I'm looking forward to more! 5) The gift of clarity. Although I didn't finish it, by simply having a list, I've gained clarity on how I want to kick off 2014. As time went on, I felt differently about the items on my list. Some items became less urgent and some took on more importance. Some led to new insights and gave me new perspective. This is not to say that I have all the answers but my discoveries made it ok to have questions. I'm excited about my findings and I look forward to going into the new year with more clarity and understanding about what I truly want from life, not just the next year. What were your biggest 2013 takeaways? What will you do differently in 2014 or maybe the same? Any tips for me? Like always, share the wealth! 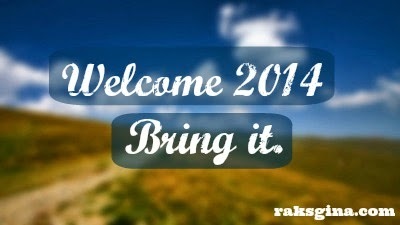 Have an amazing last week of 2013 and see you in 2014!